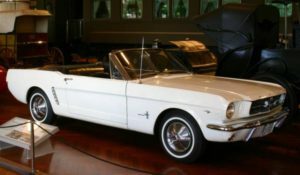 As far as Ford is concerned they simply had roughly 18 months of production on the 1965 model. What’s the big deal about the August 17 date? That was the day that Ford shut down the two Mustang plants (in Dearborn, MI. and San Jose, CA.) were shut down for retooling. 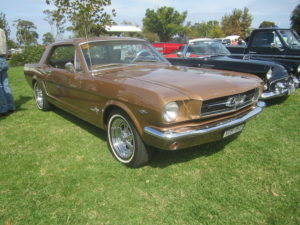 It was at this point that most agree that anything that can be called a 1964 and a half Mustang stopped being produced and the 1965 Mustang production began. There is an issue when trying to determine exactly what a 1964 and a half really is. In fact some of the early 1965 models are assembled using some or many of the “early” 1964 parts. It can be confusing to say the least. There are, however, a few well acceptedguidelines in determining year on these cars. (Either way, be prepare for a discussion when this comes up at the next car show. When discussing this issue there are two sets or groups of parts that are talked about. These are generally referred to as “1964” or “early” parts, or those that were used at the beginning of production starting in March of ’64, and “later parts” or those that came into use after the 1964 parts were exhausted. Keep in mind that some 1964 parts were used on some of the 1965 model year cars until the supply ran out. a) The first spot to look is at the corners of the cars hood at the front. 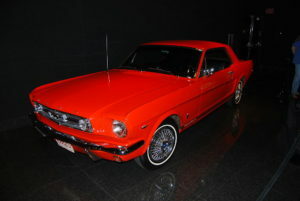 The 1964 and a half Mustang had a beveled edge that set into a groove as opposed to the more finished looking “pinched” or “crimped” method use on the 1965 Mustang. b) Passenger seats on the ’64 were fixed, or in other words not meant to adjust or slide backwards and forward. The 1965 model had adjustable passenger seats. c) The door locks are color keyed to the interior color of the car on the 1964 and while in the 1965 model they were chromed. d) The gas tank cap will not have a holding wire on a ’64 while it will on a 1965.
e) There are no Fastbacks that are considered 1964 and a half models. There may be a few of the early Fastbacks assembled with left over 1964 parts however it is widely accepted that Ford never built a Fastback prior to August 17th 1964.
f) The pedals on the 1964 were not made to accept a metal trim piece and therefore will not have the indentations around the edge you’ll see on the 1965’s. g) The rule is a Mustang with the D, F, or U engine designation is considered a definite 1964 model. Those with engine codes of either C or K were used in the 1964 and 1965 model so are of little use in identifying. h) The ’64 and ‘s had a center position off switch for the heater. These are just some of the most obvious, easily seen and most accepted differences between the 1964 and a half Mustang and the 1965. It’s an interesting bit of automobile history and a lot of fun to look into.